Symphony #9 in C Major, D. 944 "The Great"
Symphony #6 in C minor, Op. 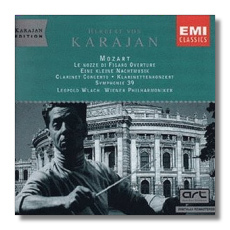 67 "Pathétique"
Here are three reissues mainly for Karajan aficionados. I suggest restriction primarily to the maestro's many supporters because the sound reproduction on these EMI releases, from 1947 to 1951, is hiss-ridden, shrill, and lacking in presence. Even for its age, it is hardly impressive. In addition, there are various bothersome sonic intrusions (thumps, crackles, static distortion, etc. ), that apparently couldn't be removed in the transfer from the 78s. 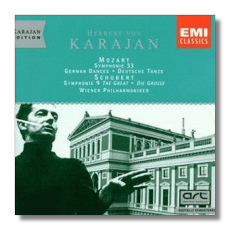 Further still, and perhaps most importantly, Karajan re-recorded these works, in general producing performances at least this effective and in better sound. He did the Tchaikovsky Sixth a half-dozen times or more; and his Schubert Ninth, while certainly a worthy effort here, is bettered by his more sumptuous, less rough-and-ready, Berlin effort on EMI, from 1978. I don't mean to suggest that these recordings are lightweight entries on the reissue market. They are, for the most part, well played by the Vienna Philharmonic and intelligently interpreted by Karajan. There are many bright spots: the Mozart in general is lively and pointed, with an absolutely vivacious and frothy Le Nozze Overture and a splendidly incisive and characterful 39th Symphony. Eine Kleine Nachtmusik, which begins with more weight and a bit less animation than what one normally hears, is another considerable success here. The shorter pieces, too, like the Chabrier España Rhapsody, are rendered with gusto and commitment. Leopold Wlach's rather straightforward rendering of the Mozart Clarinet Concerto, while competent and professional, sounds less spirited than the orchestral accompaniment. Still, the performance is effective, especially in the tender enactment of the second movement. The Tchaikovsky 6th, on the other hand, features a first movement exposition that's not wholly convincing, owing to tepid playing mainly from the reeds (try the passage from around 3:10+; and hear the stiff clarinet solo beginning at 6:04). Also, the third movement's opening note is clipped, giving the unsettling impression at first (at least to me) that a whole chunk was lopped off. To make matters worse, the sonic shortcomings at times allow the aural focus to spotlight inner lines at the expense of more crucial main ones, in the end producing a bothersome imbalance. In fact, you're apt to think the performance overall is one plagued by bouts of slipshod ensemble playing and clumsy attacks, so off-kilter are the sonics in a work that demands clarity of detail and aural balance. Too bad, because Karajan's take on the score is insightful and deftly shaped, and the orchestra's contribution is generally committed. Naturally, this dubious 6th would have to be coupled with an excellent performance of the Roméo and Juliet Fantasy, a reading filled with drama and urgency, tenderness and passionate outpourings of emotion. The pluses, as you've probably gathered, outweigh the minuses here, once your ears adjust to the dated sonics. A notable trait throughout the three discs is the near absence of that trademark legato that came to mar much of Karajan's Beethoven in his later years. Also of significance here are the Schubert 9th and Eine Kleine Nachtmusik performances, this being their first appearances on CD; and the Chabrier is a first-ever release in any form (and in sound that is not bad, probably the best of anything on these discs). 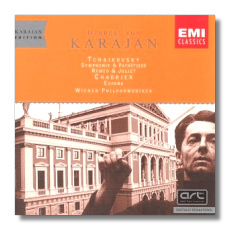 The issuance of this trio of works necessitates purchase of all three CDs for Karajan completists, since each appears on a different disc. The notes in all three issues are decent but, in a "career highlights" section, gloss over Karajan's affiliation with the Nazi party. Your decision to purchase any or all of these will probably hinge on the degree of your partisanship toward Karajan. In sum, these are worthy performances for the most part, but in opaque, sometimes irritating sonics.